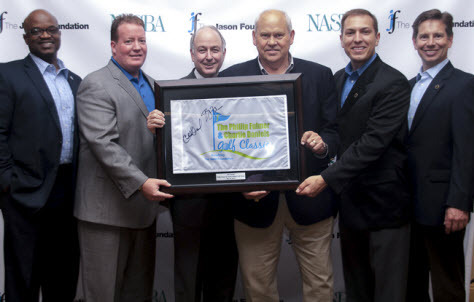 On May 20, NASBA sponsored a VIP fundraising dinner to support the The Jason Foundation. The dinner, held every year prior to the Phillip Fulmer & Charlie Daniels Golf Classic, was attended by celebrities and other corporate sponsors. The Jason Foundation is dedicated to the prevention of the “Silent Epidemic” of youth suicide through educational and awareness programs that equip young people, educators/youth workers and parents with the tools and resources to help identify and assist at-risk youth. The golf classic is an annual event and The Jason Foundation’s only annual fundraiser. The golf tournament brings about 300 supporters including golfers, sponsors and volunteers. The day concluded with a dinner, award ceremony and then entertainment provided by Charlie Daniels. In a recent Nashville Business Journal profile, when asked what he would do with $100,000 given to him to donate to charity, NASBA President & CEO Ken Bishop said he would donate it to The Jason Foundation, citing the tremendous job the foundation is doing in working to prevent suicide among young people across the country.